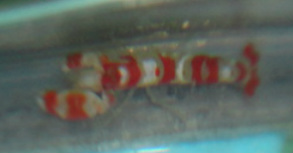 The Candy Stripe Pistol Shrimp "Alpheus Sp." belongs to the family of snapping shrimp. They are commonly called Red Banded Pistol Shrimp or Randall's Pistol Shrimp, It can grow to a size up to 4 to 5 cm, not including antennae. The chelipeds are also banded, with the right cheliped being bigger and modified into a powerful weapon. By closing at extreme speed, the cheliped expels an air bubble at more than 100 km per hour towards the prey. This action is accompanied with a loud bang. This powerful sonic weapon creates a violent shock wave which can kill or knock out prey, which could be another shrimp, or a small fish passing close. This shrimp is currently paired with a Yellow Watchman Goby.